As Facebook Shows Its Flaws, What Might A Better Social Network Look Like? : The Two-Way Facebook has become ubiquitous in the past 14 years, but it may not dominate forever. Some experts are already designing the next social networks — and they look a lot different. As some Facebook users talk about leaving the platform, ideas for a different type of social network are beginning to emerge. When Facebook CEO Mark Zuckerberg was grilled on Capitol Hill last month, Sen. Lindsey Graham asked him whether his company faces any real competition: "If I buy a Ford, and it doesn't work well, and I don't like it, I can buy a Chevy. If I'm upset with Facebook, what's the equivalent product that I can go sign up for?" Zuckerberg replied that many companies offer a version of some of the services that Facebook does. "It certainly doesn't feel like that to me," Zuckerberg answered. For almost as long as people have been using Facebook, people have been talking about quitting Facebook. The reasons tend to ebb and flow, depending on whether concerns about privacy, democracy or mental health are grabbing the headlines that week. But the reasons for staying remain pretty much the same: All our friends are here, and where would we go instead? For all its ubiquity, Facebook is only 14 years old, and just because it's dominant now doesn't mean it always will be. Given all the evident problems with Facebook's current design, I began to wonder: What might a better social network look like? And why aren't we on it yet? 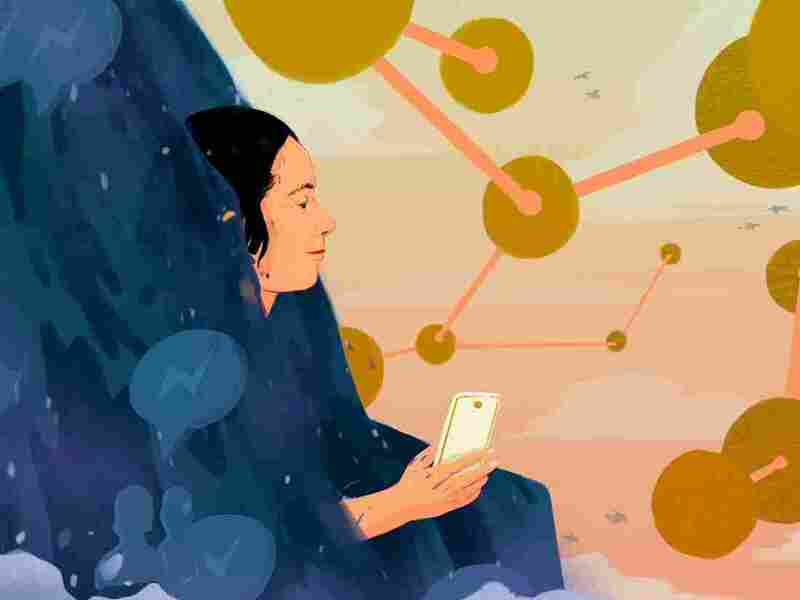 "I really think Facebook is destructive, so I've been doing that thought experiment pretty often," says mathematician and data scientist Cathy O'Neil. She is the author of Weapons of Math Destruction, a book about the potentially dangerous consequences of algorithms. She imagines the next social network as having the best parts of Facebook, without the worst parts: "Basically a town square where people can interact. They can keep up with each other, from their high school friends or their grandmothers ... but without sort of commercial predatory aspect of Facebook." Her network would have a moderator curating the conversation, and it would be a nonprofit, without tailored advertising. But she doesn't want the government to run the system, either. "I think people have reasonable concerns about who owns their data even if it's not consumer data," she says. "Even if it's just 'Who are my friends?' If that is all owned by the government and centralized — that's a problem in itself. That's exactly the kind of problem that we worry about when we hear about like the NSA having access to the metadata around our phone calls." Ethan Zuckerman is director of the Center for Civic Media at the MIT Media Lab. He also thinks the corporate, monopolistic structure of Facebook is worth rethinking. "Facebook has an awful lot of power by virtue of the fact that you have a single company making decisions for about 2 billion people all around the world," he says. Zuckerman says the next iteration of social networks could be decentralized, instead of run by one company. One example of this is a network that already exists, called Mastodon. It looks like Twitter, but it's open source: Anyone can create their own community, hosted on their own server, with their own rules. "There's lots of little Mastodon servers that have anywhere from a few hundred to a few tens of thousands of people on one another," he explains. "But they confederate: You can share information between those servers." And while the service doesn't have tons of users so far, Zuckerman says the architecture seems sound. Another aspect of Facebook that is ripe for reinvention is the algorithm that sits behind the news feed. "We don't really have control over the algorithms that sort our information and choose what we see or don't see," says Zuckerman. He and his MIT colleagues have built an experimental platform called Gobo, which allows users to tinker with the algorithms on your Facebook and Twitter feeds as you see fit – so they can get more news and less entertainment, or filter for more civil content and less rude content. They can also change the balance of men and women. "So you can say things like 'I'd like to hear from more women in my feed,' 'Mute all the men!' " Zuckerman explains. O'Neil also sees major problems with Facebook's algorithm, which she says "privileges outrage." In her ideal social network, the data scientists would design algorithms "to optimize to civil disagreement, and possibly even truth." It's both fun, and tricky, to think about what a better social network looks like. Should it be bounded by geography, so it's easier to meet your neighbors? Or is it a place to meet far-flung kindred spirits? Do you use your real name or do you keep personal data out of it? Maybe you pay to use it, or maybe it pays you to use it. And instead of being owned by a corporation, what if it were run as a cooperative? We might be better off if we didn't rely on one social network to do so many things, Zuckerman says. "We might choose to have a bunch of different networks and figure out how to link them together. It's a bit crazy that we have one social network that tries to do everything. Imagine that we had one website that tried to do everything. We had those for a while — they were called portals. and they didn't go very well." Two-thirds of American adults use Facebook, and three-quarters of those use it every day. Because of the network effect — that is, you want to go where your friends already are — it can be hard for a new social network to take off. And Zuckerman says that when other, innovative networks have threatened Facebook's dominance — it simply copied them, as it did with Snapchat, or it bought them, as it did with Instagram and WhatsApp. "The trick is right now Facebook has a quite effective monopoly," he says. "So one possibility on this could be to try to constrain Facebook from swallowing other competitors." But the network effect can cut both ways. If my friends start leaving the network, it'll be easier for me to leave, too. O'Neil says she can imagine a number of scenarios in which a real alternative to Facebook emerges. One such scenario is where people simply lose interest — that all of this "was kind of temporary insanity that we all went through where we wanted to do this in the first place," she says. There are indications that people are spending less time on Facebook – but that probably doesn't matter much if they simply migrate to Instagram. And O'Neil notes that the fate of our social networks also depends on where in the world we are. "Some of the worst problems with Facebook are happening in other countries," she says. "But in terms of the United States — I can imagine it just not lasting."